It’s the time of year when outdoor activities ramp up and those enjoying the lake lifestyle lead the way in heading outside. Taking care of the basics, will ensure your family is prepared for all the fun that waits while avoiding some very common, and preventable, family fun killers. Drink Water. 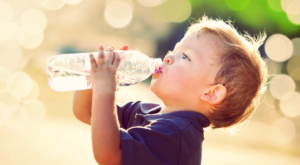 Depending on whom you ask, water constitutes 65% to 75% of your child’s body while an adult body contains approximately 65% water…not soda, Kool-Aid or sports drinks. Dehydration can cause headaches, fatigue, crankiness, and can even affect concentration. If you feel thirsty you’re probably already starting to dehydrate, so make sure you drink water regularly. The recommended daily amount of water varies by age from 5 glasses for your five year old to 10 for pre-teens and up. Don’t forget the snacks. According to the American Academy of Pediatrics Handbook, Children should eat three main meals per day and, depending on age, eat 1 to 2 in between meals or healthy snacks. Two are recommended for younger children while older children may require only a mid afternoon snack. The immediate effect of going too long between meals is a drop in blood sugar levels causing irritability, lack of energy, even confusion. None of these effects go well with family fun at the lake so enjoy a good meal before heading out and keep those healthy snacks handy. Nothing interferes with family fun like the negative effects of too much sun. Whether it’s the inability to participate in outdoor fun or a child (and parent’s) inability to sleep with sunburn, the sun can be a showstopper. 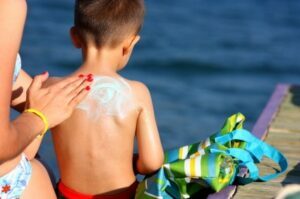 Use sunscreen with a minimum Sun Protection Factor of 30 (SPF 30) to block both UVA and UVB rays. The higher the SPF number, the better the protection. UVA cause premature aging and suppression of the immune system, increasing the risk of skin cancer. UVB rays cause sunburn. The intensity of UVB rays varies according to your location, the season, and time of day. 10am to 4pm are peak hours for both UVB rays and family fun so keep the sunscreen handy and apply often. Clothing is an often-overlooked way of protecting your family from the sun’s harmful rays. All clothing provides some measure of UV protection. However, clothing with an Ultraviolet Protection Factor (UPF) is specifically designed to protect you and your loved ones. Depending on your skin type, clothing with a UPF rating of 15 (Good) to 50+ (Excellent) may be required. Those with the most need for UPF rated clothing are children, people with fair skin and anyone spending an extended period of time on reflective surfaces such as water. Despite our best efforts, emergencies some times happen. Being prepared is key no matter how mild or serious the situation. Immediate access to emergency contact information is a stress reducer and lifesaver. Whether you’re a resident, frequent visitor, or enjoying the lake for the first time, programming local emergency numbers and medical providers in your phone saves time when you don’t have time to waste. 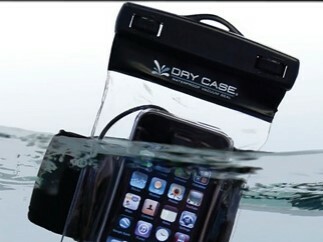 Protecting your smart phone and all it’s information from water damage will ensure you have the information if needed. Anything from a water protective case to a well-sealed storage bag will do. Your phone doesn’t float so consider throwing an empty water bottle in the storage bag or attach a float to the case for buoyancy. If pets are along for the fun, don’t forget to include a local vet in your contacts list. Keeping your family safe and healthy will ensure your time together is fun for all. It only takes a little thought and preparation to ensure everyone is energized and equipped to go out and make those great family memories that last a lifetime and that’s what the lake lifestyle is all about. Previous post: Should You Consider a Home Warranty?